Prior to studying at Oxford, can you give us some background about yourself? I grew up in Oakville, which is a suburb of Toronto, Canada. I then moved to Ottawa to study political science- the capital seemed like good place to study politics. I then worked for the Canadian government for a number of years before moving to Britain to do my Master’s. Which Rotary club were you sponsored by, and how did that come about? It was the Rotary Club of Oakville Trafalgar that sponsored me. I’ve always been involved in one way or another with Rotary, thanks to my father, who was a Rotarian. For as long as I can remember I’d come along to events, helping out however I could. I think there’s even a picture of me when I’m about four or five years old sitting on my father’s lap as he worked the phones during a fundraising telethon. I really loved it and got to meet so many incredible people who played important parts in my life. I was especially honoured in 2003 when the made me Paul Harris Fellow in recognition of the work I did with Rotary and with other initiatives. When the time came to go for my Master’s degree, applying for the Ambassadorial Scholarship seemed like an natural fit. Tell us about your time spent studying in Oxford. What was it like, what did you make of the city, how was university life and how were you treated? There are many Oxfords. The university is a surreal place- the people, this history, the traditions, the buildings… it’s unlike anywhere else (except Cambridge, obviously). It goes without saying that I loved my time there, but as a student and then as a lecturer. And the city itself is a likewise beautiful, particularly as so quickly and easily you can escape from a manic day by wandering through Port Meadow or the University Parks. I had thought that I’d only get to enjoy being there for a year; unexpectedly I still found myself there ten years later. I’m really lucky to have been able to call such a place home for so long. But I think it’s important not to over-romanticise Oxford, something that I think we’ve done far too much of in the popular imagination. 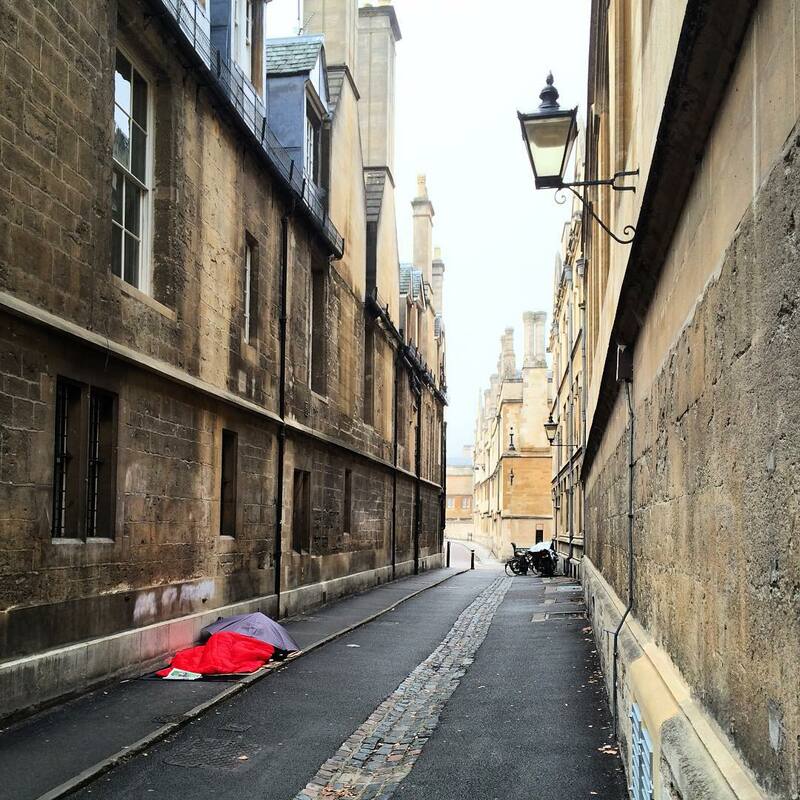 While we tend to picture only Oxford’s dreaming spires, Oxford also is a place facing a serious homelessness problem, has a worrying lack of affordable housing, and is the second most unequal city in Britain (trailing behind Cambridge). We absolutely should celebrate all that’s wonderful about Oxford, but we must not do so blind to the grave social problems too often hidden by the splendour of the university. How did you get to know the members of your host club and do you still keep in touch with any of them? I visited my host club, Oxford Isis, a number of times while I was an Ambassadorial Scholar and they were so welcoming to me. Philip and Linda Bobby hosted me throughout the year and I’ll forever be grateful to them for they did for me throughout the year (and, indeed, I still keep in touch with them). Looking back on your studies in Oxford, what influence did your time there have on your future life and career? An awful lot. In short, I wouldn’t be doing what I am today if it weren’t for my time at Oxford. I’m grateful for the career in academia that I have and whatever comes next for me, Oxford and Rotary will have unquestionably played some role in setting its foundations. What made you decide to stay in Oxford teaching? Was that always the plan when you arrived to study? It wasn’t. I had originally planned to only be at Oxford for a year. I ended up only moving away from Oxford ten years after I first showed up. Whether to stay or not after my doctorate was an easy decision to make: I was offered a great job doing what I love at one of the best universities in the world- there are very few reasons why anyone might say ‘no’ to such a thing. Also, I was really lucky- academia is brutal competition in which there are very few jobs. So it really was pretty amazing to be able to get that gig – indeed, any gig – right after finishing my dissertation. How relevant is Rotary to modern life? I’ve seen throughout my life the incredible work that Rotary and Rotarians do. Rotary, though, isn’t very good at telling its story to the wider world. It’s widely seen as just a club made up of old people doing just little bits of fundraising. And while in many cases there is some truth to that, such a characterisation misses the dynamism that Rotary can have and the world-spanning, life-changing work that it carries out. Rotary’s mission remains relevant, but if it’s going to be relevant it needs to be seen as such. In this respect, I think that Rotary can learn an awful lot from non-governmental organisations like The Gates and Clinton Foundations. Rotary has been doing the work that they do for a lot longer, but without almost no credit or visibility. What message would you give to current Rotary Scholars at Oxford? I’d encourage them to make the most of every minute of their time while they’re there. All of us lucky enough to go to Oxford only get to borrow a little bit of that place for a little bit of time, and then we move on (though, some of us cling on a wee bit longer than expected). Never lose sight of the fact that while Oxford might seem like a place that’s been there forever and always will be, any of our time actually spent there is fleeting. So cherish it as such. Part and parcel of this is to remember that it’s the people you meet and experiences you have there that will most affect your life. If the choice needs to be made between another night cloistered away in the library or a night out in the pub, chose the latter- its the memories you make there that you’ll take with you long after you leave Oxford. And, finally, I’d encourage them not to lose sight of reality. It’s easy to get caught up in Oxford’s glory, but beyond the university is a town and a world in which all is not well and gilded. Enjoy Oxford for all it’s worth, but remember your duty to then go out and make the world that’s given you the privilege to study there a better place.